Mirrors help open up a room by adding depth and reflecting light. A mirrored wall can have a dramatic effect on a room when done correctly. Gone are the days of an entire wall covered with nothing but mirrors. Today, there are more nuances to a mirrored wall that has modernized the style. The team at GlassWorks will guide, design, fabricate and install the perfect wall of mirrors in your home. A small space like the foyer can feel spacious with the addition of a mirrored wall. A wall of mirrors in the dining room can add a stylish focal point. In the bathroom a mirrored wall can be stylish while also functional, eliminating the need for another mirror on the wall. Add a unique finish to the mirrors. Like our antiqued mirrors, you can add a unique finish to the mirrors on your wall. It will add style and have the room look less like a dance studio. Use multiple mirrors. Utilizing more than one mirror together can break up the monotony of the glass on the wall. The mirrors can be all the same shape and size, have various frame sizes and shapes, or even in a pattern. Etch on a design. You can use almost any kind of material to paint, glaze, etch and draw a design onto the mirrors. If you find yourself not much of an artist, you can always hire one. Hang artwork over the mirrored wall. This can be a great way to frame a beautiful piece of artwork. You have to be careful with the hardware to mount it as you don’t want to break the glass. The artwork should also be as close to the wall as possible to not show the back of the piece and the hardware used to mount it. Don’t cover the entire wall. While this may not necessarily be a mirrored wall style, the mirrored wall doesn’t need to be completely covered by the mirrors. 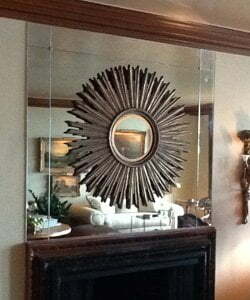 Having the wall show through can add to the design of your mirror wall. If you are looking to add a mirrored wall to your home call the glass experts at GlassWorks. Our professional glass installers will be able to advise and construct a beautiful wall of mirrors for you.